Hubertushaus was founded 65 years ago today, by European immigrants who shared an interest in German culture, hunting and fishing. We are proud members of the OFAH and we work closely with them to promote and support conservation of our natural resources within Ontario. What started out as a very small club with 12 founding members, has grown into a multi-faceted and larger German club. Over the past 20 years we have become a much-loved wedding venue, and have been a part of countless couples’ special days. We have participated in Kitchener-Waterloo Oktoberfest since 1984, a festival where we have become a household name and have won awards for our authentic Oktoberfest experience. At Hubertushaus, our members are the difference. Without our members, we wouldn’t have grown into who we are today. Thank you to everyone who has volunteered in any way and has helped contribute to the success of Hubertushaus. 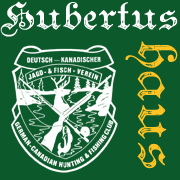 Some refer to us as the German Canadian Hunting and Fishing Club, most refer to us as Hubertushaus. We simply call it, The Club. The club is our second home. It’s where we have endless memories with our friends, family and multiple generations of club members, all a part of our extended club family. So wherever you are today, take a moment and raise a glass to Hubertushaus, here’s to the next 65 years, Prost!